Pig. 278. The schematic diagram of the Clough-Brengle Model OM frequency modulated r-f. oscillator. The 76 tube in the middle of the diagram is the constant frequency oscillator that is frequency modulated by the motor driven condenser at the left. be used with any r-f. oscillator of suitable frequency range required to cover all operating bands. The Clough-Brengle OM frequency modulated r-f. oscillator is shown in figure 278. The type 76 tube nearest the 6A7 mixer is the variable band oscillator. The type 76 tube directly beneath this tube is the fixed frequency oscillator, which is frequency modulated with the motor driven condenser. The 76 tube near the bottom of the diagram is the a-f. oscillator, which is used when modulated output is required without any frequency modulation. The 80 tube is the rectifier. For panel view see figure 278-A. is frequency modulated. T-5 is the variable band oscillator and also the mixer tube, supplying the constant band frequency modulated beat output signal. T-l is the power supply for the cathode-ray tube. T-2 is the power supply for the two oscillators. T-4 is a combination detector and amplifier. Either function may be selected by means of pin-jack connections. For panel view see figure 279-A. Both of these units can be used as variable frequency r-f. oscillators without frequency modulation. A 400-cycle tone is available in the former unit and a 60-cycle tone is available with the latter unit. We believe that alignment of a radio receiver with a cathode-ray tube, in other words visual alignment, is so far superior to the normal alignment with an output meter or some other similar type of indicating instrument, that comparison is out of the question. We feel that that fact will be proved by the photographs to follow. Fig. 279. Schematic diagram of the Egert Model VRO oscillograph. rial, so that we can start our discussion with the statement that the frequency modulated signal is available from the signal generator. At the moment, the width of the band, over which the signal is modulated, is of little if any importance. If it will expedite comprehension, let us assume that the mean signal frequency lies within the intermediate band, is 460 kc., and is frequently modulated over a 10-kc. band, so that the total band width is 20 kc. If you recall the discussion concerning the various modes of frequency modulation, you cannot help but understand that the frequency modulation takes place at an audio rate, maybe 30 cycles per second, 60 cycles per second, etc. By audio rate is meant the speed of the frequency modulating condenser rotor in such systems, or the rate at which variation of permeability occurs in systems of that type. Expressed in another manner, we can say that the mean frequency is modulated plus and minus 10 kilocycles, thirty times per second or sixty times per second, or whatever the audio rate may be, depending upon the design of the unit. In order to develop the image upon the screen, we require deflection of the cathode-ray beam in two directions, namely vertical and horizontal. The horizontal deflection voltage is secured from the timing axis oscillator or sweep oscillator. The vertical deflection voltage is secured from the demodulator circuit in the receiver or from the detector circuit associated with the resonant circuit being checked. In order that the vertical deflection voltage be available for application to the vertical plates of the cathode-ray tube, it is necessary to convert the radio or intermediate-frequency signal voltage from the frequency modulated oscillator into an audio voltage variation. This is done by feeding the signal voltage, developed across whatever circuit is being checked, into a detector tube and rectifying the r-f. or i-f. voltage. In other words, if a frequency modulated signal covers a band of frequencies extending from 450 kc. to 470 kc., this band of signal voltages, at each instantaneous frequency within this band, is rectified and a voltage is developed across the demodulator load or output circuit. The envelope of this rectified voltage during a complete cycle of frequency modulation is in accordance with the resonance characteristics of the resonant circuit which feeds the detector. Examine figure 280. It is the fundamental circuit used for alignment. The frequency modulated signal is fed into the resonated system being checked. The output voltage over the frequency modu lated band is fed into the demodulator tube. Rectification occurs and a rectified voltage is developed across the diode load resistor. The magnitude of this voltage at any one instant during the cycle of frequency modulation is dependent upon how the resonant circuit passes the signal of that frequency. Perhaps "pass" is not the correct pends on the signal voltage built up across the resonant circuit. term. 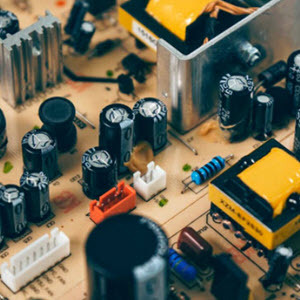 It would be better to say that the rectified voltage at any one frequency is dependent upon the signal voltage built up across the resonant circuit or system. Bear in mind that the voltage supplied from the frequency modulated r-f. or i-f. oscillator is of constant level over the entire band developed by the frequency modulating system. The greater the voltage built up across the resonant circuit or system and fed to the detector, the greater the rectified voltage across the demodulator load or output and the greater the deflection of the beam in the vertical direction. If the operation of the circuit is such that it will not allow the development of a voltage at frequencies between 450 kc. and 455 kc. and also between 465 kc. and 470 kc., there will be no rectified voltage available across the diode load during those instants, when the frequency of the frequency modulated oscillator is generating these frequencies. This condition will be evident upon the cathode-ray tube screen in the form of an absence of a vertical deflection for this portion of the resonance curve. If the circuit operation is such that maximum carrier voltage is built up at 460 kc., which may be the resonant frequency of the circuit, the maximum rectified voltage will be developed across the demodulator load. The envelope of the voltage, built up across the demodulator load, varies at an audio rate, namely at the rate that the frequency modulation occurs. To keep the pattern upon the screen stationary, the horizontal deflection voltage (sweep voltage) is adjusted to synchronize with this audio rate. pends on the signal voltage built up across the resonant circuit. scriptions given earlier in this chapter, did not involve the process of rectification. Without rectification, it is impossible to develop the resonance curve upon the cathode-ray tube screen. The facts given here are basic and apply to all types of patterns, single and double line images and to all types of frequency modulating systems.
. Without entering upon the discussion of the theory of coupled circuits and resonance curves, we feel that certain pertinent facts should be brought to your attention, for what good they may serve during the process of practical alignment. You have seen several examples of resonance curves upon previous pages. These may be divided into two classes; for that matter all of them may be divided into the same two classifications. These are "symmetrical" and "asymmetrical" or "non-symmetrical." By a symmetrical resonance curve is meant one which shows the same amplitude response for frequencies which are higher or lower than the mean frequency by like amounts. Another definition of a symmetrical resonance curve is one which can be cut through the middle, along its vertical axis, be folded over and have the lines coincide. Asymmetrical curves do not possess these characteristics. Figs. 281, left, 282, middle, 283, right. Examples of symmetrical resonance curves, having one and three peaks, are shown in Figs. 281 and 282. See Fig. 273 for a two peaked curve. The resonance curve of Fig. 283 indicates a wider band-pass than does the curve shown in Fig. 281.
with the graphic development of the resonance curve image. Asymmetrical curves, or non-symmetrical curves, may be obtained from the same type of circuits. Examples of non-symmetrical curves are shown in figures 284 and 285. Regeneration, Sh extremely important factor, is responsible for the lack of symmetry in the curve of figure 285. Figs. 284, left, 285, right. Two oscillograms of asymmetrical resonance curves. The lack of symmetry in the curve of Fig. 285 was caused by regeneration. regeneration and incorrect adjustment of the coupling between the related circuits. Where coupling is fixed, which usually is the case, correct operation is secured by adjustment of the tuning of the related circuits. This fact should be borne in mind during alignment operations when basic curves are not available for comparison. As a rule, two winding transformers develop a sharp single peak, depending upon the degree of coupling and resonance adjustment. Three winding transformers usually are closely coupled transformers and develop double or triple humped curves, depending upon the tuning and coupling adjustments. However, it is possible with a three winding transformer to develop a single peak, just as in the case of the critically coupled two winding transformer. A high sharp peak is not always the desired adjustment. It is necessary to understand the requirement of band width. Since the transformer is supposed to pass a band of frequencies with minimum suppression, the ideal curve is the square flat-top, which cannot be accomplished in practice. However, the nearest approach is desired, consistent with maximum amplitude, thereby obtaining maximum signal transfer through the unit with minimization of sideband suppression. Symmetry of the resonance curve is a pre-requisite, as has been stated. thermore, since the operating frequencies relating to the i-f. amplifier are fixed and those of the r-f. system are variable, it is necessary to consider the overall response curve with respect to the mean frequency of the signal being fed into the receiver input. So much for the general details concerning the shape of the resonance curves. A detailed discussion is not necessary in this volume, because we must assume that the man, who intends applying the cathode-ray tube to alignment, is familiar with the shape of the curve he must develop, or at least with the general shape of the curve, with respect to the requirements of the system. The cathode-ray tube provides the picture of the actual curve and the effect of the adjustments made. That which was only a guess with meter type indicators, now can be viewed by the operator. Before discussing the various types of images, which may appear upon the screen, it might be well to make some comments concerning the dimensions of the image and their effect upon its interpretation. It stands to reason that a fair sized image is required in order to enable proper interpretation of the information conveyed. However, it is also necessary to realize that it is possible to distort the image appearing upon the screen, by making the image too great, so that it extends beyond the curved boundaries of the screen. In addition, it is possible to distort the image by the application of an excessive voltage to the vertical deflection plates and cause overloading of the amplifier, with consequent flattening of the top of the curve. Last, but not the least important point, is distortion of the image as a result of overloading of the amplifier tubes, associated with the resonant circuits being checked. Examples of this will be given later. Concerning the dimensions, a height not exceeding iy2 inches, when using the 3 inch tube, is ample for examination and interpretation. The maximum length of the base line of the image should likewise not be greater than 1 y2 inches. This assumes that the image is centered upon the screen. The dimensions of the image, assuming them to be correct, do not in any way change the characteristics of the pattern. That is to say, the response characteristic of the circuit is not changed when the dimensions of the image upon the screen are changed by varying the cathode-ray tube control equipment. It is possible that the pattern may appear as if the characteristics had been changed, but no such change has actually taken place. Since the base line of the resonance curve is determined by the frequency modulating circuit and the response characteristic of the resonant circuit being tested, increasing or decreasing the length of the base line, by varying the cathode-ray oscillograph horizontal amplifier control, does not change the ratio between the total frequency band sweep and the band passed by the resonant circuit. Expressed in another manner; if the total frequency sweep is 20 kc. and the band passed by the circuit is 5 kc. each side of the mean frequency, this relation, as shown upon the resonance curve, does not change when the horizontal sweep amplitude is changed. For any horizontal sweep amplitude, the same ratio will be "found to exist in the pattern. The same is true of the vertical displacement. Increasing the height of the peak may make it look narrower, but in reality no change has taken place. This condition can be checked by establishing the ratio between the total frequency sweep and the band passed, by measuring the line representing the total sweep and the space indicating the band passed. This apparent change due to adjustment of the vertical and/or horizontal amplifier gain controls was mentioned earlier in this volume in connection with sine waves. For any given resonance curve pattern, the greater the frequency band passed with respect to the total band established by the frequency modulating condenser or unit, the greater the separation between the bottom of the sloping sides of the curve. The narrower the band passed under the same conditions, the closer together will be the bottoms of the sloping sides of the curve. It is because of this relation that a "high" frequency sweep, with a much wider band width, will develop a narrow response curve; whereas a "low" frequency sweep, with a much narrower total band width, will develop a wider resonance curve, when both signals are applied to the same circuit. There are several methods of connecting the cathode-ray oscillograph to the receiver for visual alignment. However, only one of these is really correct, in that it provides the correct pattern with freedom from distortion. With both single and double image systems of the motor driven frequency modulating condenser variety or with the electrically operated forms of frequency modulation, development of the pattern requires that an audio signal be present. This audio signal is at the rate of frequency modulation. Certain forms of circuit connections, between the cathode-ray oscillograph and the source of the rectified signal required for alignment, introduce phase distortion of the audio signal, with the result that the resonance curve pattern is badly distorted. The image, instead of having its base upon the same horizontal plane, has one side of the base cor-recdy placed and the other side displaced below what would normally be the correct base position. Such distortion is introduced when the rectified signal from the receiver is fed to the oscillograph through a capacity of insufficient value, as is usually the case when the vertical deflection voltage is secured across the audio volume control and the said volume control is connected to the source of the audio signal through a blocking condenser. This system is to be found in a large number of radio receivers using diode demodulators. Figs. 286-A, 286-B, 287-A, 287-B, from left to right. The oscillograms of Figs. 286-A and 287-A show phase distortion in single peaked and double peaked curves, respectively. Correct corresponding curves with no phase distortion are shown in Figs. 286-B and 287-B. when a triode demodulator is used with resistance-capacity coupling between the demodulator and the subsequent amplifying tube and the vertical deflection voltage is taken off across the grid leak of the amplifier tube. These references to distortion assume that the coupling or blocking condensers, present in the circuits mentioned, are of insufficient capacity. Examples of such phase distortion for a single peaked resonance curve and for a double peaked resonance curve are shown in figures 286-A and 287-A. The correct corresponding curves, free from phase distortion, are shown in figures 286-B and 287-B. 280. Supplementary AVC and audio resistor connections have been omitted from the diagram, because they have no bearing upon the operation. It is possible that the circuit found in a receiver may be slightly more complicated than that shown, having more resistors in the load circuit. Be that as it may, the vertical deflection plates should be connected across the diode load. The two curves shown in figures 286-B and 287-B were made with the signal voltage secured from across the diode load. The three major circuit arrangements, with several possible points of connection of the vertical plates of the cathode-ray oscillograph for alignment operation, are shown in figures 288, 289 and 290. Figs. 288, left, 289, middle, 290, right. Schematic diagrams showing two types of demodulator circuits with three types of load circuits. The correct points for connecting to the deflection plates are indicated by V. The results obtained when connections are made to other points are explained in the text. These diagrams illustrate two types of demodulator systems with three forms of load circuits. In the diode system of figure 288, connection between point V and the ground is the most preferred and provides an undistorted pattern, such as was shown in figures 286-B and 287-B. Connecting the vertical deflection plates between VI and ground, introduces the blocking condenser and if its value is not great enough, the distortion shown in figures 286-A and 287-A is produced. 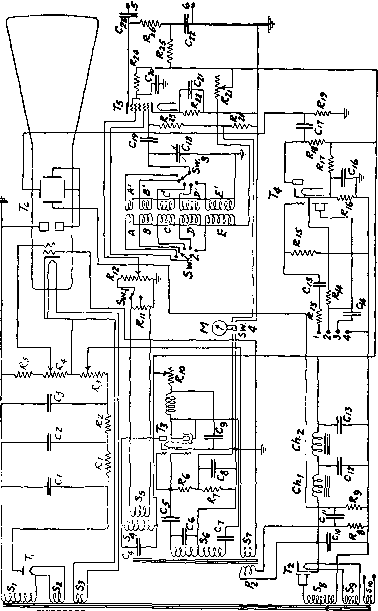 In a triode circuit with resistive load, the correct connecting point is between V and ground or across VI and ground, providing that the blocking condenser used in the circuit is at least .5 mfd. If connection is made at point V2 instead of at V, the pattern will be fuzzy, because it will contain some of the carrier voltage. In a triode circuit with a reactive load, the correct connecting point is at V, but it is necessary to shunt a variable resistor across the reactance in the plate circuit, or the reactive load can be temporarily disconnected and a 50,000-ohm or 100,000-ohm resistor may be inserted in its stead. If a variable resistor is connected in shunt with the reactive load to correct the phase distortion, its maximum value should be about 25,000 ohms and the resistance should be varied until the corrected pattern appears upon the screen. What has been said about connections to various demodulator systems, applies to all the types of oscillographs or visual aligning devices, irrespective of the type of frequency modulation employed in the device. Figs. 291, left, 292, right. Both the resonance curves shown here have their lines broad because of the presence of an appreciable amount of carrier voltage. made fuzzy by the presence of carrier voltage, such as would exist if the vertical deflection plates were connected to that portion of the demodulator circuit which carried appreciable carrier current or voltage, or, if in a diode circuit, the r-f. bypass condenser, connected across the diode load resistor, were removed. Figure 292 illustrates a resonance curve of a non-symmetrical circuit, with a large amount of carrier voltage present in the rectified a-f. signal, applied to the vertical deflection plates. Figs. 293, left, 294, right. The output of the frequency modulated oscillator, used for making the resonance curve of Fig. 293, was also modulated at 400 cycles. The curve of Fig. 294 shows the presence of another carrier voltage that is beating against the frequency modulated signal, zero beat being at the mean frequency. What are the signal reguired for the cathod ray tube?